As the Second World War raged throughout the early 1940s, Britain looked to the Caribbean for volunteers to train as ground crew for the Royal Air Force (R.A.F). Thousands of men answered the call, with approximately 5,400 volunteers arriving in Britain to serve between June 1944 and the end of the conflict in 1945. Four thousand of these men did their initial basic training at R.A.F Hunmanby Moor, Filey. In the Autumn of 1943, recruitment for ground crew duties for the R.A.F began in the Caribbean. Immediately, articles appeared in popular newspapers such as Jamaica’s Kingston Gleaner urging men between the ages of 18 and 32 to sign up and help the war effort. The response was overwhelming with thousands of young men travelling to their nearest recruitment base to add their names to the list of volunteers. While some wanted to experience life outside the confines of a small island, others joined the R.A.F with hopes that they would learn to fly. However, the overwhelming sense was that the majority simply wanted to help the ‘Mother Country’ in her hour of need. Once they had volunteered, the men were put through a series of tests to ensure they were physically and mentally equipped to join the R.A.F. Their results, qualifications and skills were all documented and sent to Britain. However, as Hedley Jones remembers, despite their skills West Indian men were only volunteered for certain trades due to racially discriminatory practices within the British forces. While they waited to be called up, some of the recruits carried out a basic form of training in the Caribbean. This was later expanded upon in Filey. In the spring of 1944, around 2,000 of the Caribbean recruits were called up and prepared for their voyage to Britain. It is unclear if all the men, or only those who boarded the S.S. Cuba were taken to America before they landed in Britain. Several of the recruits, such as Earl Barrington Beckford, Vivian Blake, Histon Boreland, Hedley Jones, Alford Gardner and Noel Hawkins remember their experiences in Newport News, Virginia. In America, most of the West Indians witnessed racial segregation for the first time. Although, Black American soldiers could not live in the same quarters as their counterparts, all of the West Indian servicemen were housed together with the white American soldiers. Racial slurs were commonplace and some of the West Indian men were verbally abused. They must have been rather relieved when after a week or so they were transported to New York and boarded a ship for Britain. During the war, Atlantic crossings were extremely dangerous as enemy submarines patrolled the waters. Fear coupled with sea sickness, freezing temperatures and inadequate rations must have made the voyage very difficult for the West Indian recruits. During Carl Chantrielle’s voyage the men were fed split pea soup which made an awful mess when they were all sick. Their ship also encountered a German submarine and was engaged for combat off the coast of Ireland. West Indian recruits at R.A.F. Hunmanby Moor, Filey. 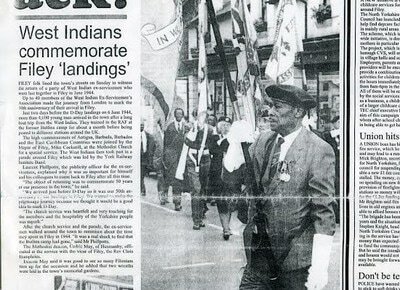 The first contingent of West Indian recruits, consisting of 1,000 men, arrived in Britain at the beginning of June 1944. Their troopship, H.M.S Esperance, landed at Liverpool where they were greeted by cheering crowds, the R.A.F band and the Secretary of State for the Colonies, Oliver Stanley. Shortly after their arrival they were transported to East Yorkshire to begin their initial training. The men made their way to R.A.F. Hunmanby Moor, which had been requisitioned by the government in 1941 from Billy Butlin, who had started to build a holiday camp in the summer of 1939, just before war broke out. Fifty-two rows of chalets, each with its own washbasin and two central-heating pipes, were finally erected. The main buildings, heavily glazed by virtue of their pre-war design, had to be painted with ‘black-out paint’. Hence their interiors were very dark indeed and electric lights were needed throughout the day. The boating lake was excavated, tarmacked over and used for a parade-ground. As the first contingent settled in, the second group who had disembarked from H.M.S Harrower were making their way to the camp. In total, it is likely that in the summer of 1944, approximately 1,950 men from the Caribbean were based in East Yorkshire to complete their basic training which included drilling, weapons training and physical activities. three other servicemen went to a shop in the town to send a photograph home. The shop assistant came running down the stairs; however, when she saw them, she got such a fright she ran to get a male colleague. Eden also mentioned that if he went into a pub people would buy him drinks and wanted to touch his hair for luck. He remarked that he didn’t mind local reactions to the Black servicemen because he knew they were not a common sight in the region. 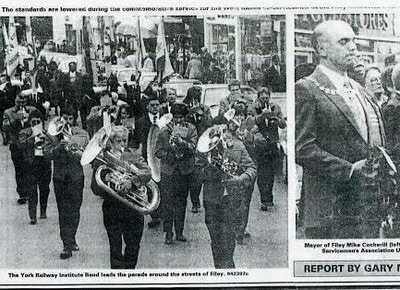 He also stated that his overall experience in Filey was positive. Although the residents of Filey embraced the West Indian volunteers, life was not easy in the camp. For those that landed in the winter of 1944, the weather was bitterly cold which led to ailments and on occasions fatalities. Brenda Grey remembered that because of the harsh East Coast weather many cases of pneumonia occurred in the weeks after the third contingent arrived in November 1944. 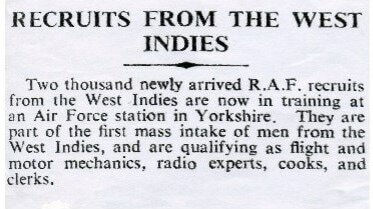 Although approximately 4,000 West Indian servicemen came to train at R.A.F. Hunmanby Moor, today their presence has been largely forgotten. However, if their story has triggered any memories and you would like to share your story please contact us HERE. 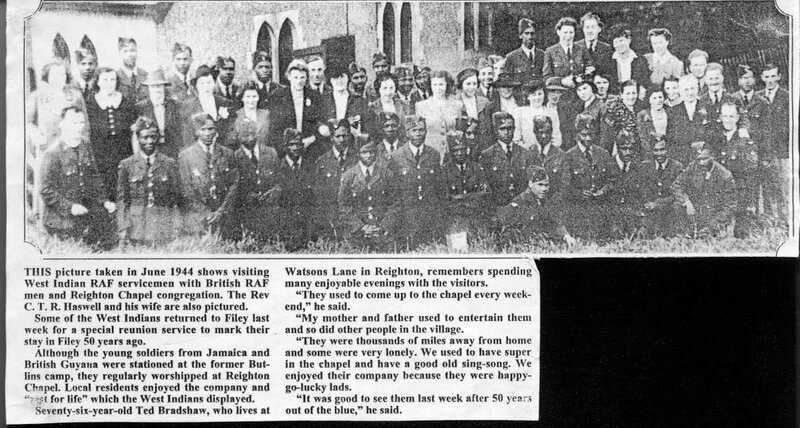 When the war ended in 1945, a few West Indian servicemen remained in the R.A.F. However, most were repatriated back to the Caribbean where nothing was done to help them find employment or settle back into island life. Thus within a few years, a number of the ex-R.A.F. men returned to Britain. Many settled permanently and made important contributions to British life. Click HERE to read short stories about some of the lives of the R.A.F. West Indian ground crew who trained at Filey. 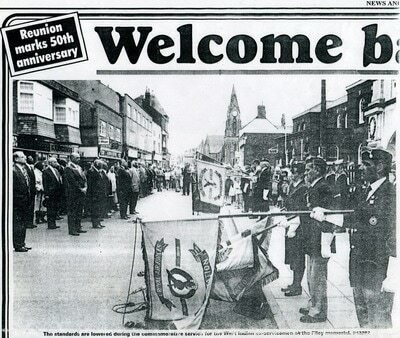 On Sunday 11 June 1994, around 40 of the men who trained at Filey returned to the East Yorkshire town for a reunion. 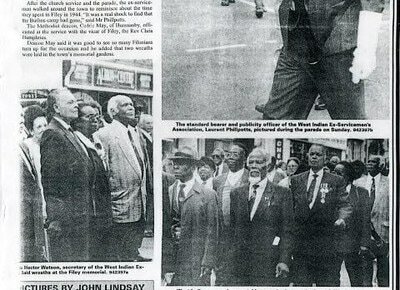 After a parade, the West Indian veterans, high commissioners of Antigua, Barbuda, Barbados and the East Caribbean countries alongside Mike Cockerill, Mayor of Filey met at the Methodist Church for a special service. When reminiscing about his time in the region, ex- R.A.F. serviceman Laurent Phillpotts said that he could not believe that the Butlins' camp was gone. Ces Mowthorpe, A Village at War, Pindar, 1986, pp.23-4. Filey and Hunmanby Mercury, 18 June, 1994. With thanks to Audrey Dewjee and the Crimlisk Fisher Archive for helping us with this research.